Models that forecast atmospheric events represent complex relationships between many factors, including the impact of natural and man-made aerosols on local and global climates. By gathering detailed data over time, our understanding of the composition and movement of aerosols expands. 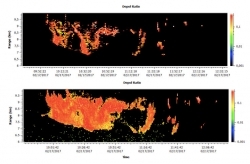 Sigma Space’s new high-definition Mini Micro Pulse Lidar (MiniMPL-HD) remote sensing system provides greater granularity for assessing airborne particles and supports increased accuracy in predictive analysis. The MiniMPL-HD leverages the compact design of the current MiniMPL system and adds enhanced capabilities valuable to meteorologists, researchers and air quality professionals. Upgrades to the unit are responsible for increasing the efficiency, resulting in more pulses and more returns. Also, the range resolution of the MiniMPL-HD has been doubled to 2.4m, up from 5m. This increased sensitivity to aerosols is extremely valuable for calculating continuous boundary layer height measurements in regions where aerosol loading is typically low. Real-time integration of radiometric data with the MiniMPL-HD data stream is another important feature. The result is a more complete atmospheric profiling that includes moisture and temperature piped in from a radiometer, mixed with highly accurate boundary layer aerosol data.